1. 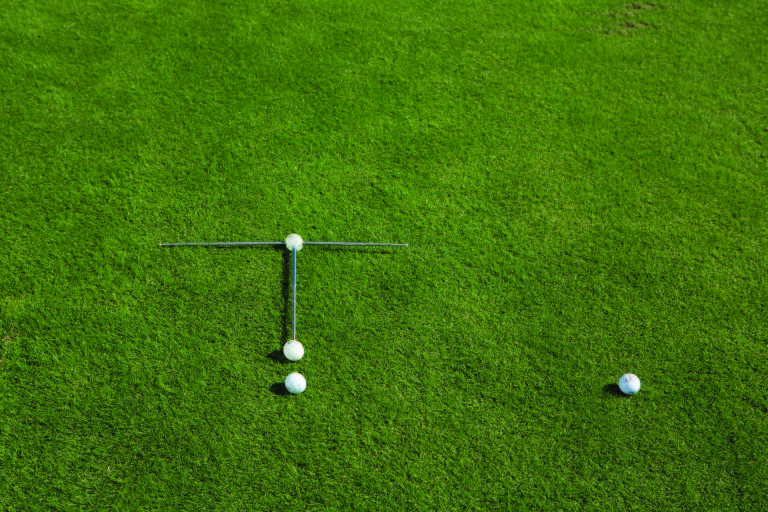 Place the golf ball you want to hit on the ground or on a tee depending on the club you’re using. 2. Place a second golf ball as an intermediate target about 3 feet in front of the ball to be hit along the target line. 3. Lay your Swing Station down on the ground with the two shorter collapsible rods extended out and parallel to the target line. You can adjust the rods for a desired width of stance and length of club used. 4. Make sure the “Golfer” logo ball should be about 4 inches away from the ball you’ll be hitting. You’re now set up correctly with the club face at the target and your body parallel and left of the target line. From this angle you should now be able to see how you can use every club in the bag to work on consistent alignment with every shot. NOTE: For occasional points of reference in the following setups, your Swing Station has a Middle Ball connecting the three rods and with the “Swing Station” logo on it, and a Tip Ball at the end of the center rod with the “Golfer” logo on it. We will refer to these Middle (“Swing Station”) and Tip (“Golfer”) balls in the tutorials as well as a third “Intermediate Ball” which can be any standard golf ball you want to place on the ground to visualize your Target Line.